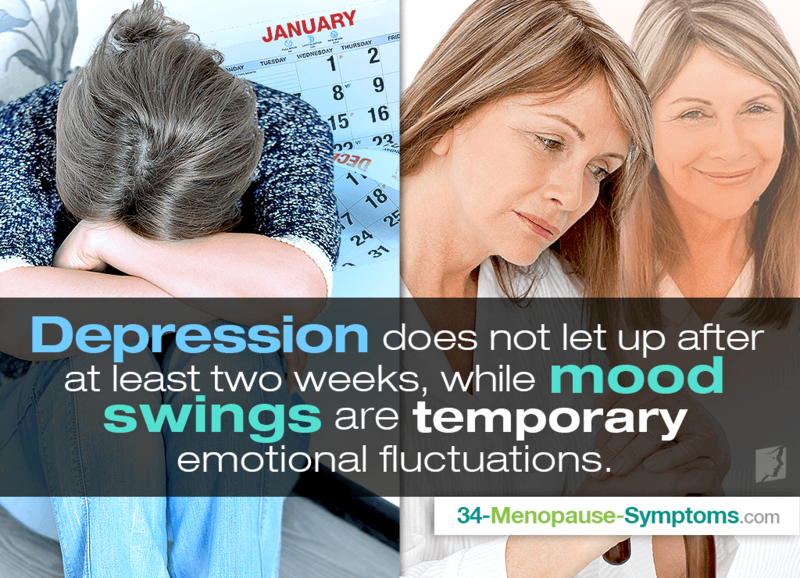 Mood swings are a normal part of menopause, as are mild depressive moods. However, women may feel like they need clarification between distinguishing the two symptoms from one another. Continue reading about the difference between mood swings and depression so you can be better informed about your mental health. Mood swings are sudden shifts in an emotional states that seem to have no underlying trigger. They are usually temporary and should not drastically interfere with everyday life. For menopausal women, mood swings are a result of unbalanced estrogen levels that affect serotonin production, the mood-regulating neurotransmitter. Depression is characterized by permanent feelings of hopelessness, sadness, and negativity with decreased activity levels. For perimenopausal women, it is common to occasionally experience depressed moods that subside within a few days at most as drastic hormonal fluctuations deregulate neurotransmitter functioning. However, keep in mind that permanent or chronic feelings of helplessness and uselessness may be more than a symptom of unbalanced hormones. Clinical depression is not a symptom of menopause and should be addressed by a professional. Telling the difference between mood swing and depression is a matter of time. Depression is a semi-permanent state of hopelessness and fatigue that does not let up after at least two weeks, while mood swings are temporary emotional fluctuations that may include occasional bouts of depressed moods. Though it may not be easy to get rid of, there are many forms of treatment available for those who suffer from depression, including more advanced treatment. A doctor may recommend depression treatments that foster hormonal balance - in menopausal women - as well as counseling, antidepressants, anti-anxiety medication, or a combination of the three. Click on the previous link to learn more. Depression should be dealt as early as possible. This article talks about the most common symptoms of depression, which you might recognize. Depression is categorized as a chronic feeling of sadness and hopelessness.